While to the outside world, Belgium may look like a country that argues over language, inside the country, there is an even hotter debate – who serves the best Belgian waffles? Here at CheeseWeb, we don’t shy away from hard-hitting topics, so we wanted to weigh in on the great waffle debate. For us the best waffles come not from a waffle cart but from Belgium’s traditional cookie-maker, Dandoy. Dandoy has been baking delicious treats in Brussels since 1829, so we expect they are pretty good at it by now. It wasn’t waffles however that made this company famous, it was cookies (or biscuits to you British types). Dandoy makes a variety of different cookies including the favourite Dutch and Belgian treat, the Speculaas (or Speculoos in some circles); a spicy, crunchy gingerbread cookie. At Christmastime, you can see giant speculaas cookies in the shape of various saints, including Saint Nick himself of course, decorating the windows of the various Dandoy shops. 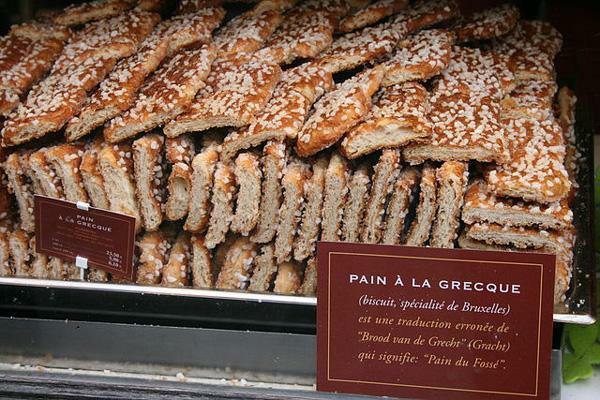 Some of the other tasty treats you’ll find in the Dandoy shops include: almond bread; pain a la Grecque (or Greek Bread), a Brussels speciality with cinnamon and sugar; macaroons and shortbreads of various flours. So you’re probably wondering what happened to the waffles we mentioned above. 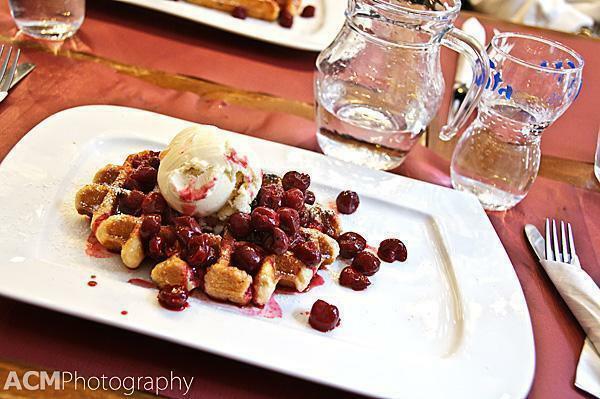 You can find the magical Dandoy waffle at one special location, the Dandoy Tea Room, steps from Grand Place. 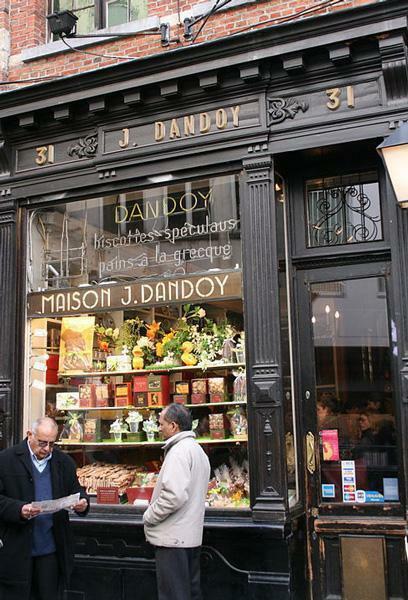 From the street level, the Dandoy shop on Rue Charles Buls looks much like the others. Step inside and you will see a couple of differences. For one, there is normally someone making waffles, behind the counter, to sell as take-away treats. Secondly, you’ll notice a set of stairs, heading up to the Tea room. In the Tea Room, you can sit and enjoy your waffle at your leisure, while admiring the collection of antique speculaas moulds decorating the walls. In Belgium, the controversy doesn’t stop at who makes the best Belgian waffle. Oh no! Just like the Flanders vs Wallonia debate, there are two waffle contenders – Liege or Brussels. The Brussels waffle is rectangular and flakey. It isn’t as sweet as its rival but is often topped with whipped cream, chocolate or various fruit toppings. The Liege waffle is normally rounded and has crystallised sugar baked into it, making it slightly sticky and sweeter than the Brussels waffle. The CheeseWeb vote goes to the Liege waffle but our ranks are split on how best to enjoy it. Andrew prefers whipped cream and chocolate or caramel toppings. I fell in love with Dandoy’s cherry-topped waffle with a scoop of vanilla ice-cream. Devine! 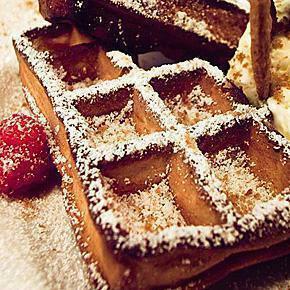 Whichever waffle and toppings you prefer, we suggests to give it a try at the Dandoy Tea Room. It’s a great place to discuss any of the great Belgian debates. What’s your favourite waffle? Let us know in the comments below.